“All coppers are constables” so the old saying goes. 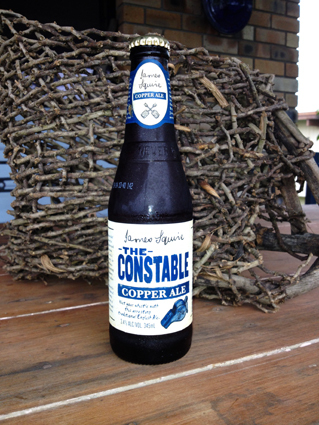 Well, this Constable is a copper ale brewed by James Squire. I’m a bit of a fan of Mr Squire’s but hadn’t come across this ale until I had the pleasure of attending the first Ashes test in Brisbane, back in November. I really enjoyed the cricket, well, I say enjoyed, endured would be more appropriate. The first session of the first test was pretty good, after that things went downhill faster than Franz Klammer and I was left with a bitter taste in my mouth …… and not in a good way. The main consolation, apart from the fantastic steaks at The Pineapple Hotel, was the discovery of the Constable. The label invites you to “Wet your whistle with this arresting traditional English Ale” and from the get go it had me banged to rights. A rich and sparkling cuprum in colour, the ale has plenty of fizz. Of course there’s hops on the palate but also fruit, rockmelon and bananas with a tinned fruit salad finish. Very satisfying and more-ish ….. especially after a 5-0 series whitewash. Another two thumbs up, and twenty wickets down ….. roll on the 6 Nations.